Finally there was the French painters to explore their own country. Until that time, we knew the historic landscape especially in the tradition of Nicolas Poussin and Claude Lorrain, tradition at the time of David the painter kept Valenciennes (1750-1819) and, after him, Bidault (1758 -1846), Michallon (1796-1822), Jean-Victor Bertin (1775-1842), Aligny (1798-1871). A one degree below was placed on pastoral or rustic style, its representatives, Watelet (1782-1866) in mind, meticulously painted landscapes of France, decorated with accessories such as cottages, mills, waterfalls. These painters neat, alongside artists more original, but unrecognized, like Moreau the Elder (1740-1806), on the other hand the English-Constable (1776-1837) and Bonnington (1802-1828), inspired by France, were the forerunners of the great nineteenth-century French landscape. Gustave Michel (1763-1843) and Paul Huet (1804-1869), formed by the study of Dutch and Flemish, played the role of scouts. Men of their time, they do not merely see the landscape, but they try to give it a soul. The merit of exploration of new territories they discovered will return to artists we have grouped under the name of the Barbizon School. A group of French naturalist painters, their approach to painting, beginning in the 1830s, opened the door to Plein-Air Painting, Impressionism and Social Realism. Barbizon School painters were based in the village of Barbizon, France on the outskirts of the Forest of Fontainebleau. 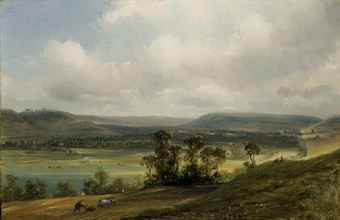 Most were landscape painters who expressed fascination with changing seasons, changing times of day and the effects of light on the landscape. Barbizon artists had no agreed-upon style, but were revolutionary because of their commitment to portraying nature as a worthwhile subject in its own right rather than something that was so remote that it could only be expressed through romanticized and sublime images. In other words, nature was something that could be experienced personally and painted subjectively and not just romantically or philosophically. Barbizon School painters often included toiling peasants in their landscapes—persons who had little time or inclination towards ‘contemplation’ of nature. This approach was also revolutionary in prevailing approaches to fine art, which showed preferences for genteel subjects such as aristocrats basking in the beauty of their surroundings. Barbizon artists are considered the first “plein-air” painters, those who painted directly in the outdoors rather than completing their scenes in studios from sketches. Chief among the original French Barbizon painters were Camille Corot, Francois Millet, Theodore Rousseau, and Charles Daubigny. This entry was posted in ART, PAINTINGS, PRINTS, DRAWINGS on October 27, 2012 by webmaster. I will right away grasp your rss feed as I can not find your e-mail subscription link or e-newsletter service. Do you’ve any? Please let me understand in order that I may subscribe. Thanks.